High Quality Content by WIKIPEDIA articles! Martin Chemnitz (November 9, 1522 April 8, 1586) was an eminent second-generation Lutheran theologian, reformer, churchman, and confessor. 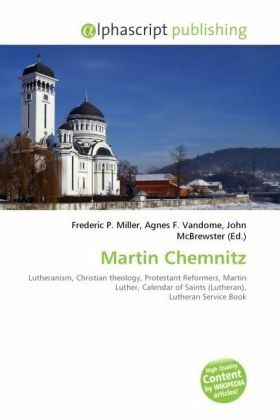 In the Lutheran tradition he is known as Alter Martinus, the "Second Martin": Si Martinus non fuisset, Martinus vix stetisset ("If Martin [Chemnitz] had not come along, Martin [Luther] would hardly have survived") goes a common saying concerning him. He is commemorated as a pastor and confessor in the Lutheran Service Book of the Lutheran Church - Missouri Synod on November 9.